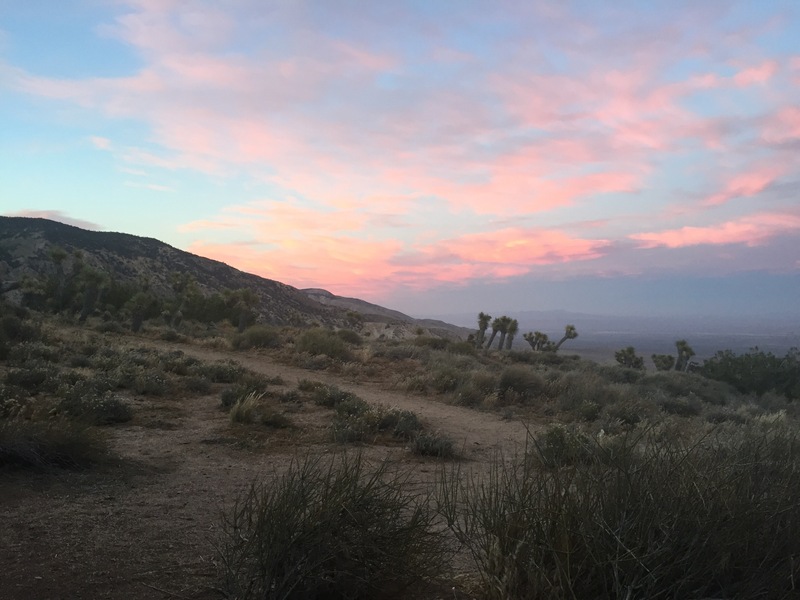 We had a good “nero” day in Mojave, meaning we hiked nearly zero miles on day 34 of our trip. The day before we picked-up our maildrop at the Motel 6, which included a new pair of shorts for me! We slept in, ate some good town food, and then caught the bus in the late afternoon as the heat started to break. The first 1.5 miles of trail paralleled a major highway, with the last bit going through a construction zone and right by 50 bee colonies; officially making this the least fun miles of trail we’ve hiked. Fun fact though, this is where Cheryl Strayed started her PCT hike, and they filmed that scene in the movie Wild here, too! 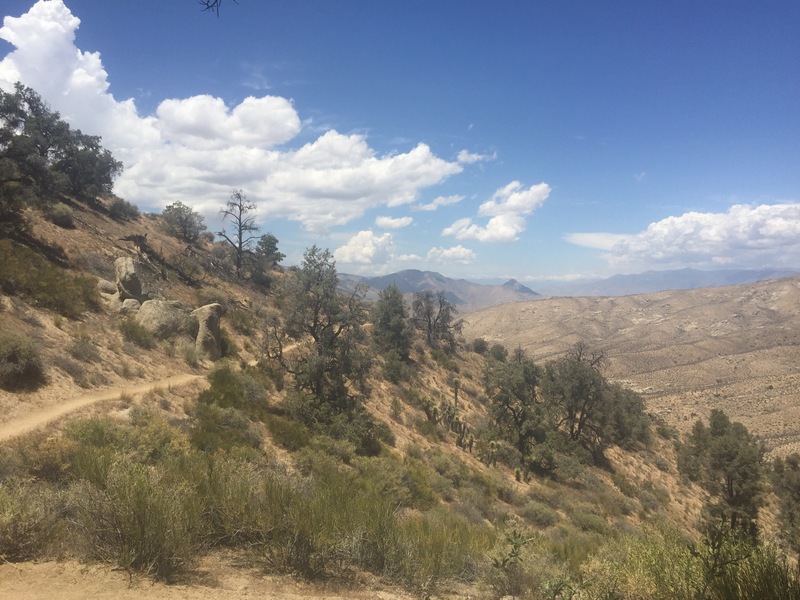 After the bees and traffic, we started our ascent out of Tehachapi Pass. 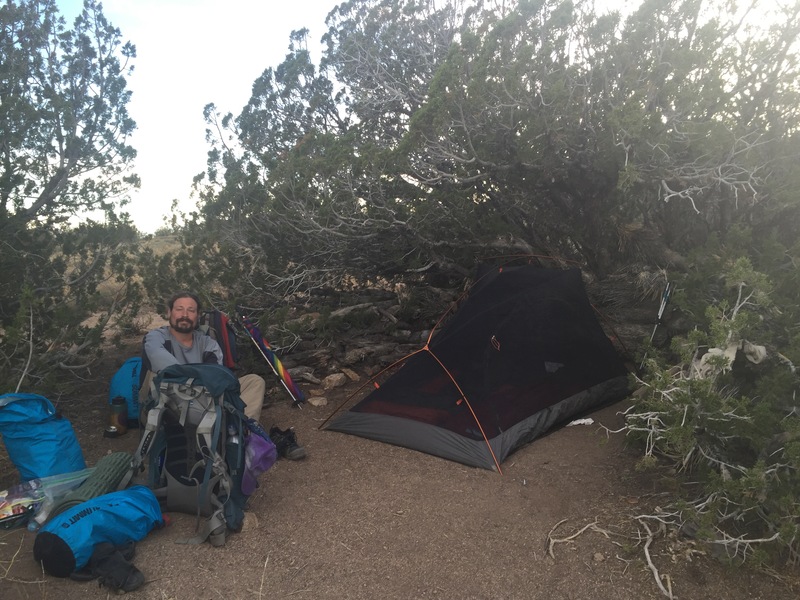 We didn’t get too far before we got hungry, and couldn’t pass up a lovely camp spot under a juniper bush. Truth be told, I was most nervous about this section out of any on the trail so far. Not only did we pick-up seven days worth of food, our biggest maildrop yet; it is also the driest section of trail, meaning we have to carry more water than usual. 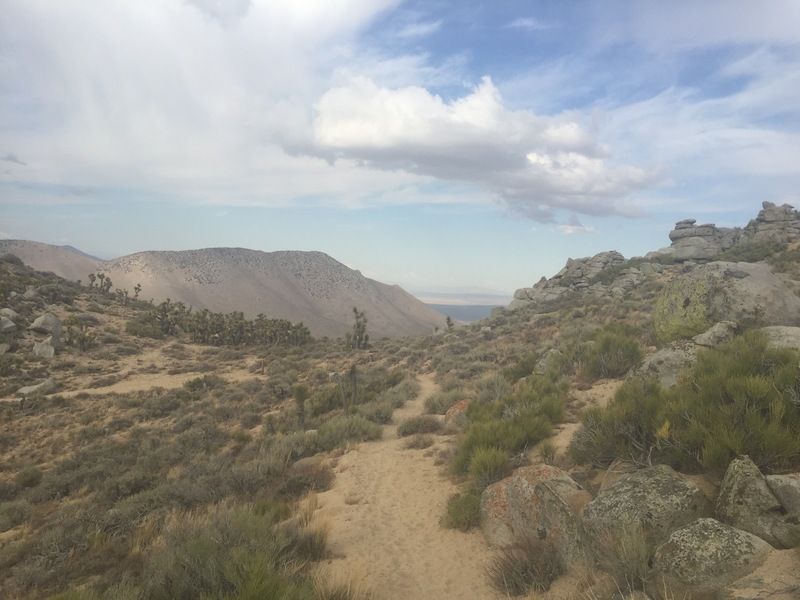 Additionally, we actually hike through some of the Mojave desert! I was intimidated, but Garrett reminded me we’d been hiking through desert for most of our 566 miles- and we’d been fine, so we could do this (and of course, he was right!). As it turned-out, although the water sources were further apart, and our packs were heavier with food, the trail was surprisingly plesant the next day. We made it to Golden Oaks Spring by early afternoon, and took a long break as has become our per usual as the days have been uncomfortably hot lately (and dangerously so, with the water scarcity). Day 36 surprisingly brought more trees, and two nice water sources; and we camped in some pines towards the edge of the forest, and the beginning of the desert. Our second water source that day at Landers Fire Tank was the last sure source of water for about 42 miles. To carry over two gallons of water (nearly 20lbs!) 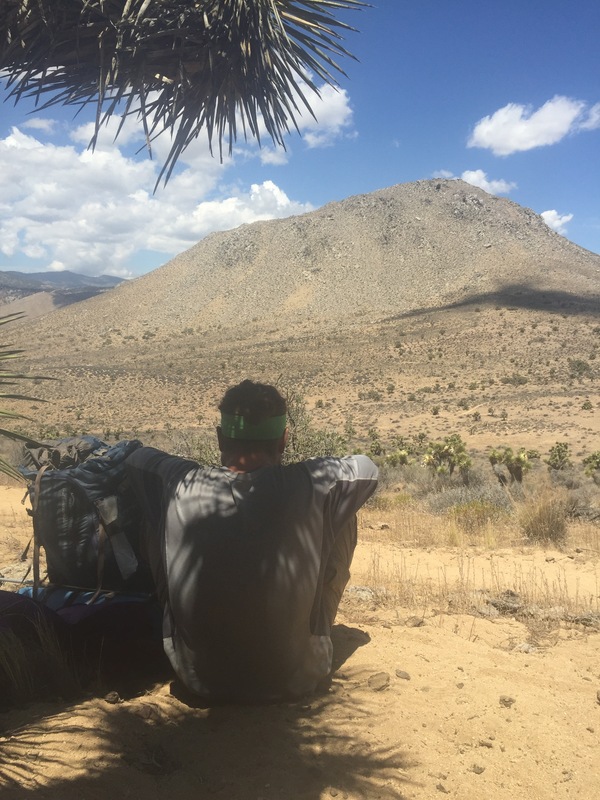 atop all of our food and gear seemed unwieldy, and I knew it would slow me down considerably. 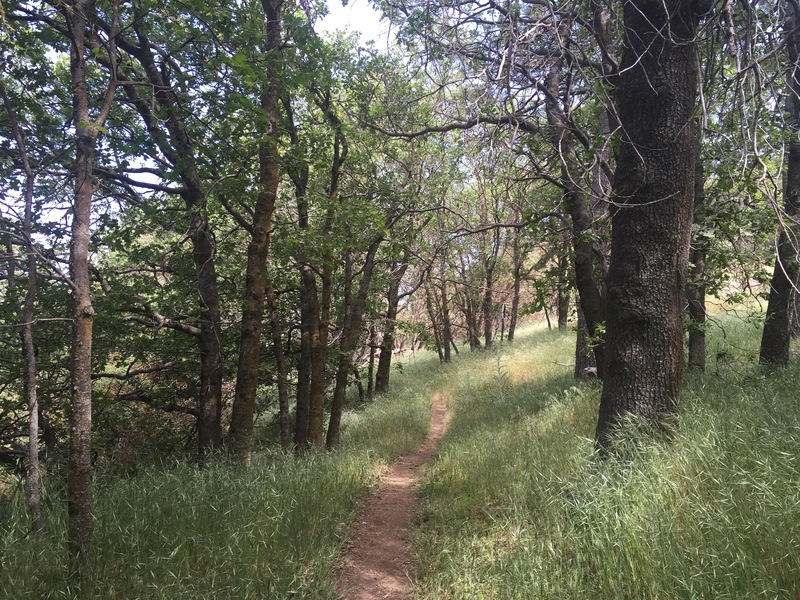 We did some online sleuthing, and discovered that there were two water caches that other hikers had reported regularly maintained by trail angles along the way. And while generally water caches cannot be counted on, these two seemed like good bets. 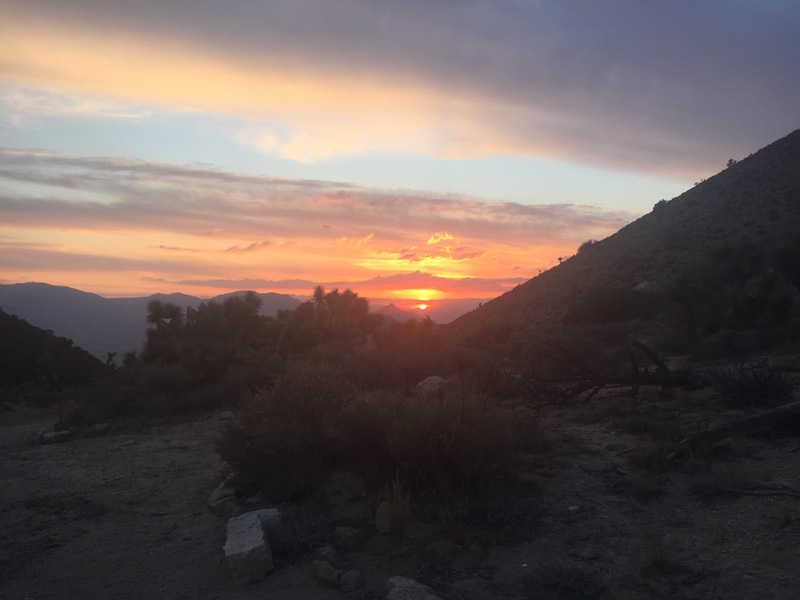 I took enough water to keep me safe, knowing that if there was no water at the caches we’d have to night hike to avoid the heat and use less water. Fortunately, there was water as anticipated at the Kelso Road cache six miles into day 37. I had just been saying that my hiker hunger had really started to set in, when Cinnabun (the trail angel who maintains the cache) pulled-up with even more water, cookies, and of course- cinnamon buns!!! I ate my fill, chugged more water, and filled-up to get the 15 miles to the next cache. We entered the Mojave soon after, and were blessed by a partly cloudy day that made the heat much more tolerable! The desert, while we got quite the workout walking on sand all day, was beautiful. We ended the day at Bird Spring Pass, where there was indeed plenty of water supplied by trail angel Devilfish (and much appreciated single serve packs of delicious peanut butter!). We made camp, and enjoyed the sunset; grateful for the kindness of the people who make these dry sections possible. Just starting to follow your blog. Sounds like an awesome adventure and that you are really enjoying the experience. Stay cool! I love hearing the description of the trails. And so interesting about the planning for water. Something I take for granted, even here in Harpswell where wells can run dry. It’s amazing that there are so many people who act as “angels” for hikers, leaving you supplies and water. Thank you so much for sharing your trip, am enjoying all the pictures and your descriptions of the journey. Hi to Garrett! Be safe! Enjoy! Thinking of you!